Naming rights could pay half the cost of the subsidized "Barclays Center"
The big news, according to yesterday's New York Post, is that today Forest City Ratner will announce that London-based Barclays Bank will sign a lucrative naming rights agreement for the proposed arena within the Atlantic Yards project. And the New York Times reports today that the deal would set a record for indoor sports arenas, with Barclays agreeing to pay nearly $400 million over 20 years. But the big story behind the planned Barclays Center--forget the "Brooklyn Arena" placeholder, which was long gone from the official site--isn't how much a British firm might spend to get a foothold in the New York media market. And it isn't even the obvious irony that "Brooklyn pride," as New York Magazine's Chris Smith pointed out yesterday, inevitably gets pushed aside when it comes to business. It's that Forest City would get Barclays to pay for perhaps half of the construction cost of the arena (and others to pay significant chunks.) That would make the most expensive arena in the country, at $637.2 million (p. 7), a lot easier to build. The developer's costs are further reduced by an array of subsidies and tax breaks. The state will offer Forest City tax-free bonds to construct the arena. At a 5% interest rate, $637.2 million would mean payments of about $41 million a year over 30 years, just about twice the estimated Barclays payment. The financing for the arena and project remains murky. "I want to know how much these tax breaks are," said Bettina Damiani of Good Jobs New York, which monitors government subsidies. "That's our bailiwick. How have public officials been able to support a project when they don't know what the costs to taxpayers are going to be, and they don't know what the expenditures for services are going to be? That should be a bipartisan question." I asked the Empire State Development Corporation (ESDC) if bonds would be used to pay "rent" on the arena, since one ESDC document mentioned such rent (despite the $1 figure in the MOU). I also asked how much the annual PILOT (payment in lieu of taxes) would be. 1. PILOT payments will be applied to debt service on the tax exempt bonds. 2. There may be additional "rent" payments that are applied to taxable debt. 3. There are no rent payments for the use and occupancy of the arena (other than nominal rent and as described in 1 and 2 above) that will be retained by ESDC. 1) ESDC would lease the land for $1 to a Local Development Corporation (LDC), organized at the direction of the ESDC. 2) The LDC would issue tax-exempt bonds to pay for building and fitting-out the arena and ancillary facilities. 3) An FCR affiliate (ArenaCo) would use the bond proceeds to built and fit-out the arena. 4) The LDC would lease the land and arena to ArenaCo, which would agree to maintain, operate, and lease the arena for professional basketball and other events for at least 30 and not more than 40 years. 5) Taxable bonds would pay unspecified "certain costs" of constructing the arena. 6) Because ESDC would retain ownership of the land, and ESDC or the LDC would retain ownership of the arena during the initial term, the land and improvements would be exempt from real estate taxes. ArenaCo would agree to make payments not to exceed the amount that full real estate taxes would be if the land and improvements were not tax exempts. 7) Excess PILOT payments would be used to defray the cost of operating and maintaining the arena. The financing deal might be considered old news. After all, it was in the Memorandum of Understanding the city and state signed with the developer nearly two years ago, on 2/18/05. However, as Damiani said in response to my query, the questions remain. "Transparency is what it comes to. For those of us who watch these large economic development projects, we know people have these numbers. To do that upfront as early as possible and make that public, that should create an atmosphere where the public would feel confident that this is a good use of our resources." Criticizing the closed-door process, she suggested that project backers "are much more concerned about being able to sell a large glitzy project to local officials than to the people who are going to support it financially, the taxpayers." The "publicly-owned arena"--in the ESDC's sporadic description--would benefit from public funding and technically be owned by the ESDC, as noted. The Independent Budget Office (IBO), in a September 2005 report, attempted to quantify some of tax breaks. On an arena costing $555.3 million (the cost at that time; the Times today erroneously used a similar figure and also erroneously described the arena as having a "park" on top, rather than private open space), the IBO suggested the subsidy--a cost borne primarily by federal taxpayers--had a present value of $91 million. Now that sum would be larger. Beyond that, the IBO pointed out, PILOTs are a better deal than in a more conventional development model, where a developer would have to make both construction financing payments and property tax payments. The IBO calculated savings at $14 million. Indeed, Damiani queried, "Why should the taxpayer be grateful that large wealthy franchises are going to be paying some of their taxes? People working in the office buildings are going to be taxed on their wages. Small businesses and their employeers are going to have the burden shift to them. It's not fair." And what's the value of the $1 lease for the arena site? Unclear. The developer will have purchased the private property, and rights from the MTA. 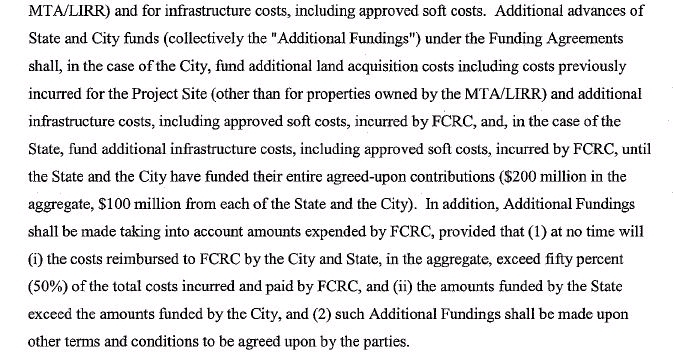 But FCR also would get city streets for $1, as well as a city-owned parcel of land. The IBO estimated those two properties' value at about $150,000--at a modest $20/square foot--but surely the value is already significantly higher, given the skyrocketing land value in Brooklyn. There's other murkiness in the IBO report, which doesn't quantify certain subsidies (such as for housing and the value of condemnations, "friendly" and otherwise), even though it concluded that the arena would bring in a modest fiscal gain. (That's in dispute.) Nor has the ESDC fully quantified costs and benefits. And there's even more in the GPP. 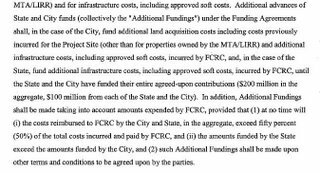 For example, look at the passage copied at right (click to enlarge) and try to figure out whether the "Additional Fundings" cited in the final sentence would exceed the announced $200 million in subsidies the state and city have pledged. It certainly seems so. Is this the "extraordinary infrastructure costs" named in the original Memorandum of Understanding? Damiani pointed out that the New York City Industrial Development Agency (IDA) in September voted to adopt policies that shine new light on the process for allocating taxpayer subsidies. "By no means is it perfect, but there's a glimmer of transparency at the city [level] that is not there at the state [level]," she said. Maybe the bankers at Barclays can help.